The dynamics of human motion whilst well understood qualitatively, have been difficult to quantify with inertial sensors due to the complexity of movement of relatively unconstrained limb segments. A study of highly constrained limb motion was undertaken through the development of a novel instrumentation. Results obtained demonstrate that the quantification of subjective measures can be a useful tool in improving athlete performance. The study of Japanese swordsmanship, in the various traditional martial schools, has developed patterns of movement that are highly repeatable from athlete to athlete within individual schools but have significant difference between schools. Anecdotally traditional masters of these arts take many years to perfect this characteristic shape of movement. The project arose through an intrest and study of aikido in brisbane. Uni axial and more recently tri-axial accelerometers have been used to quantify human motion whilst undertaking different activities. 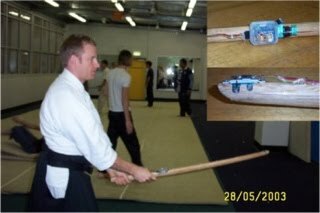 A custom sensor system comprising of four accelerometers was mounted on a practice sword (bokken). These sensors enabled both the tip and hilt of the sword to be monitored during practice sessions. More than 10 practioners with a range of experience level were recorded whilst undertaking a basic swing. Key characteristics of the swing were extracted. Correlation was found to exist between experience level and sensor output. It is hoped that by providing immediate quantifiable feedback an athlete improve more rapidly. Furthermore the application of the monitoring and analysis to other sports that exhibit more complex swing characteristics is envisioned.